Thread: How would I hook up this PA setup? Not running two speakers only one. 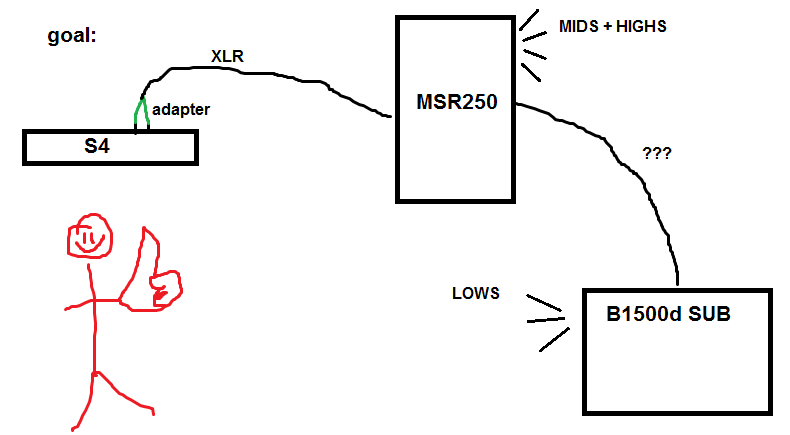 I have an adapter that sends both main outputs through to one XLR cable which i plug into my msr (see diagram below). I've also attached a picture of the backs of each unit! CAN I DO IT? would i run it through the LINK OUT port or?!?! "I have an adapter that sends both main outputs through to one XLR cable which i plug into my speaker"
be careful using those stereo to mono plug adapters. Sometimes they make the audio sound strange and/or blow your amps. I would hook it up single channel as mentioned above and see if you can get Traktor sound settings to output a mono signal. Last edited by loverocket; 07-15-2014 at 06:52 PM. Totally agree with that, you can phase the bass out by sending left and right to one speaker or send more voltage than your input can handle.